In an effort to minimize traffic on the Hill and impact to our neighbors, FSHA has established a transportation program whereby all students are required to participate in one of the transportation options described below. The program is beneficial to our families as well, as it reduces overall transportation costs and provides another means by which students may meet and socialize with their classmates. If you live near a bus stop, this is the easiest option. It is convenient, safe, economical, eco-friendly, more reliable than car-transportation and provides relief to parent drivers. Currently, there are three bus routes. See the link to the right for our current bus schedule, which includes a late bus at 5:40 p.m. The annual bus fee for the 2018-19 school year is $1,195. Siblings ride for free. In addition, parents are credited 15 service hours, a $225 value, reducing the cost to approximately $2.75 per trip. Sign up on or before registration day to receive a special discount. Students who do not live near a bus stop may carpool with an eligible student driver or parent driver. 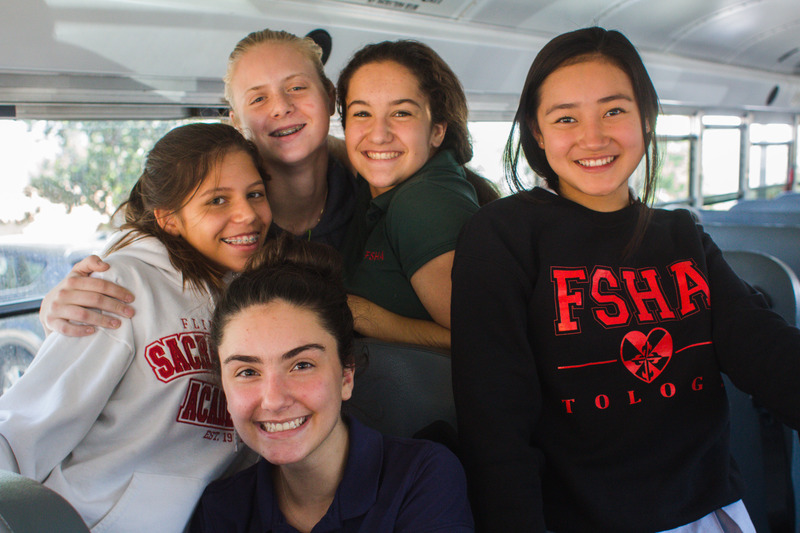 FSHA provides a number of resources to assist parents in identifying a carpool partner. Only students with a zero period class or morning sports practice may arrive on campus with only one student in the car. In April, registration is required for your transportation mode for arrival at school during the morning peak hours of 7 to 8 a.m. While students are encouraged to maintain their carpool/bus ridership during the peak afternoon hour of 2:45 to 3:45 p.m. as well, departure transportation modes are not mandated due to the variables in student after school activities.